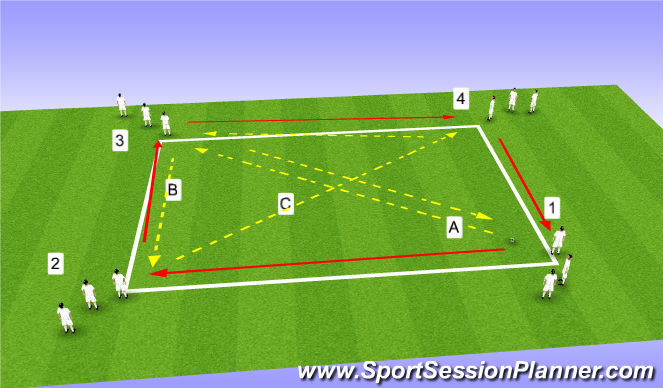 4 players in square.They play to outside player,make wide run and open body to receive ball back foot and then move quickly with ball over 5 to 10 yards to enter box.Then out of box and repeat with another player. 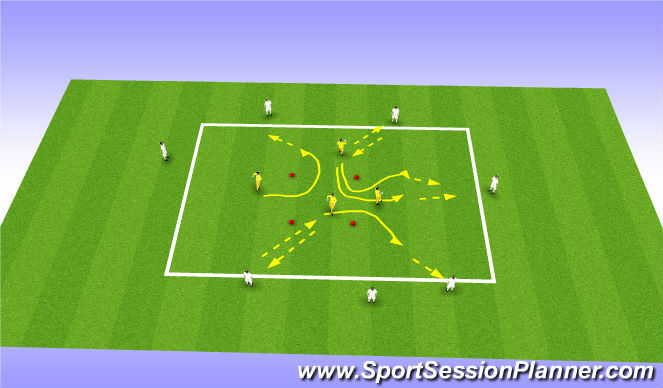 then vary::4pass on outside,enter square and go out to the left/right/turn and go out same way you went in.Basic but coach&apos;s role is to emphasize and encourage players to receive the ball and move quickly to box and speed of interchange on outside. Organisation: 20 x 20 yard square,equal number of players on each corner..
Two rules: players always run clockwise around square. pass the ball in direction of run of player who passes you the ball!!!!!!!!!!!! Extension. Limit to two touch then one. reduce area-move square to 5 yards square and play one touch!! Quality of touch to receive. Quality and timing of pass. Awareness to watch players run. 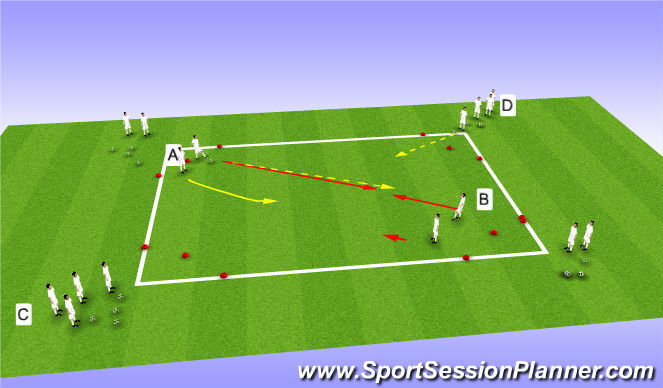 Session Objective:To improve defending in 1v1 and 2v2. Organisation:As before.15 metres by 15 metres.Corners coned across 2 metres each side of corner. Now 2v2.Player A plays ball to either of B players and two A players now defend.Nearest A player closes down.Other A player balances off to support and cover.Coaching to also focus on balancing off if ball moves from one B player to other. 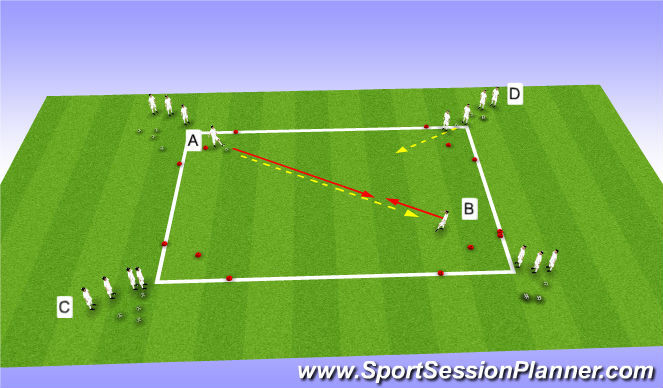 Once the ball goes dead or B scores, A and B players move to the right and join other groups.So B goes to the back of C and A moves to the back of D.
Then the practice continues with D playing diagonal ball to C corner.This means as players rotate they will get opportunity to attack and opportunity to defend. Pressure -nearest man closes down quickly,angles,distance and shape as before. Support and cover-second man takes angle and distance of front man. Communication-determine who will close down, then last defender must communicate and "control" situation. 15 metres by 15 metres.Corners coned across 2 metres each side of corner.Player A plays ball to Player B.Player A then follows ball to defend B getting ball into corner area(area behind red cones in A corner).Once the ball goes dead or B scores, A and B move to the right and join other groups.So B goes to the back of C and A moves to the back of D.
Cover the ground quickly to close down. Brakes on to close down, about 1 metre away. Low crouched position.Be patient,Threaten the ball. 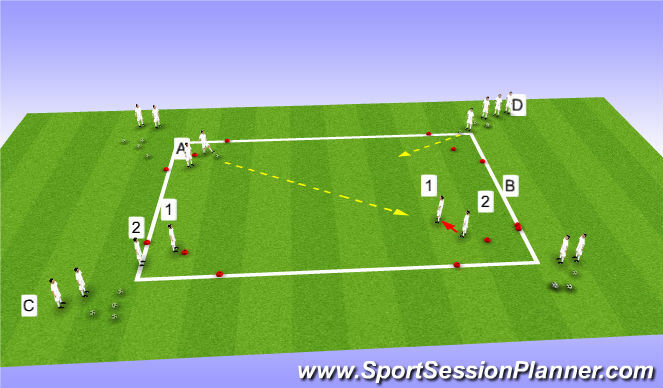 1v1 .Player A plays ball to first B player(1),who receives ball and shields from second B player(2),who is behind him. B2 must now prevent B1 scoring in B goal. Once the ball goes dead or B1 scores, B players move to the right and join other groups.So B goes to the back of C and A moves to the back of D.
Then the practice continues with D playing diagonal ball to C corner.C1 holds and C2 defends.This means as players rotate they will get opportunity to attack and opportunity to defend. B2 to stay tight and not allow B1 to turn. Be "touch tight",make sure you can see ball.Be patient but pinch ball if possible. Stop attacker turning or getting past. 2 appropriate sized goals.Balls by side of goals. Game starts by goalkeeper feeding .